I amn't really very religious by nature. I do follow the festivals and recipes to the dot since I love that part of them. Navarathri is such a festival I enjoy visiting houses where I am invited, appreciating the 'Kolu', singing, exchanging 'kumkum' and flowers and savouring 'Sundal' prasadams. These days I am getting to know much about how the 'sundals' are related to the Navagrahas(the 9 celestials) and 'Navadhanyams' or the 9 cereals/pulses/legumes for the 'Navarathri' or the '9 nights' festival! Tuesday – Angarakan – Sevvai – Mars: Thuvarai (Thuvar Dhal)- Sundal can be made. Here's how I made with whole Thuvar grams. Wednesday – Budhan – Mercury: pasi Payar (Green Gram)- Sundal can be made. 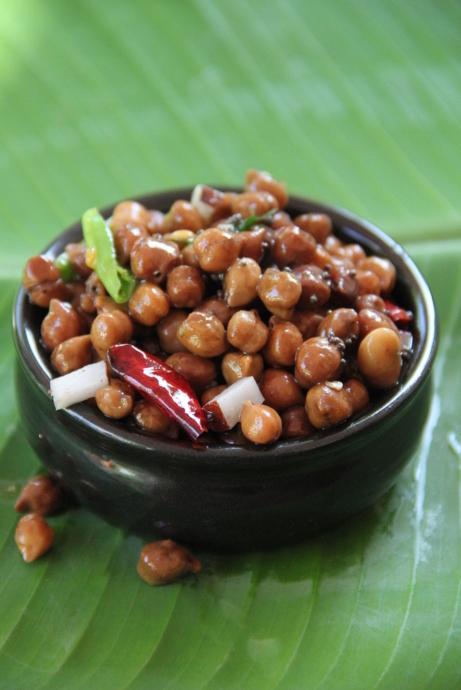 Thursday – Guru – Jupiter: Kadalai (Channa dal) or Konda Kadalai (Whole Channa or Cow peas) Recipe featured for today below! Saturday – Sani – Saturn: The tiny black Ellu seeds (Sesame Seeds) neivedyam can be 'ellu urundai' or the sesame seed balls. 9th day of Navarathri – Ketu: Uzhundu (Whole Urad )"Vadai" can be made. Here's the recipe for Vella Vedai made with a combination of jaggery and urad. The recipe for today is Konda Kadalai Sundal, the Thursday's 'neivedyam' or the offering for Guru. 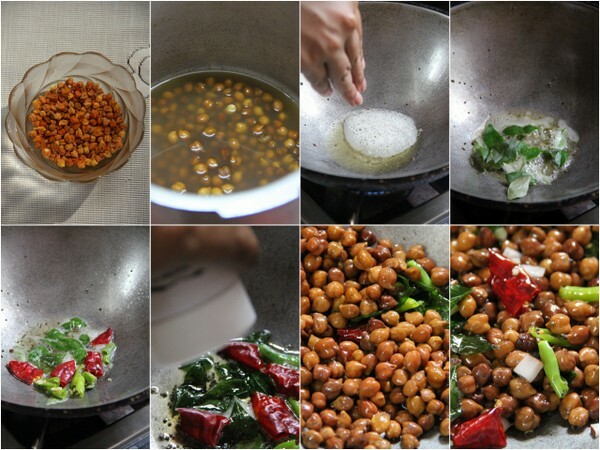 Soak Channa for at least 8 hours. Pressure cook till soft with 1/4 tsp salt added to it. It needed 5 whistles in our 3 ltr cooker. Discard water. Heat oil for seasoning. Splutter mustard seeds, (ah! that's my sister posing her hands in) brown the urad dal, throw in the curry leaves, chillies and add the asafoetida. 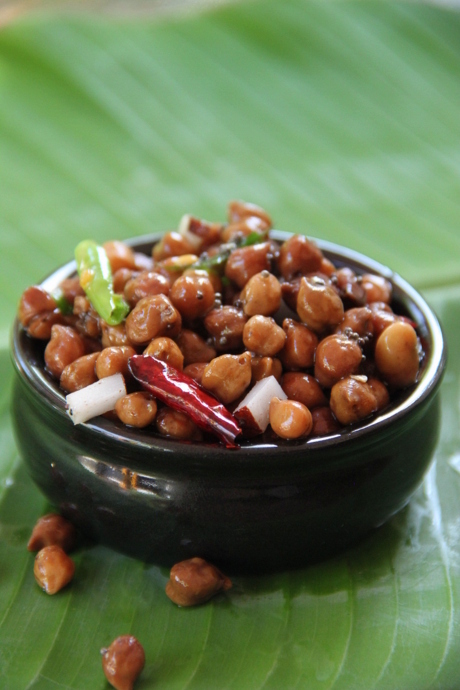 Dump in the cooked channa and stir or toss to combine with the seasoning. Check salt and add grated coconut or bits. Serve warm for the Gods as 'neivedyam'! 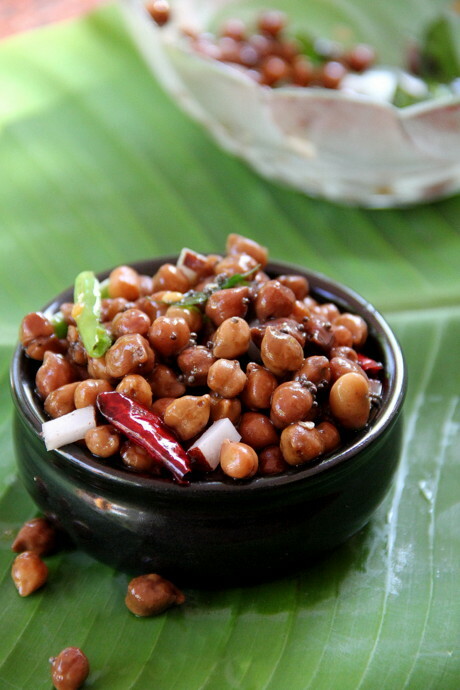 We; my family back home in Kerala personally like 'sundal' with unroasted coconut bits. If you add them along with the seasoning, the bits get slightly toasted and become crunchy and flavourful. Somehow we prefer raw coconut for this recipe.